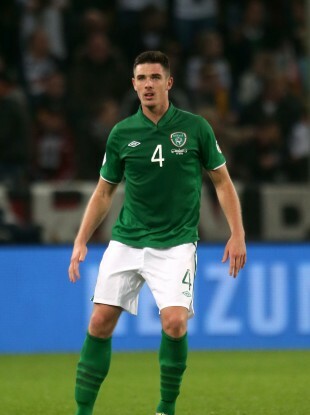 Ciaran Clark impressed in the wins over Gibraltar and Georgia. ASTON VILLA DEFENDER Ciaran Clark is absent from the revised 27-man Ireland squad for next week’s vital Euro 2016 qualifiers against Germany (8 October) and Poland (11 October). The news is a blow to Martin O’Neill, with Clark performing solidly in the recent qualifiers against Gibraltar and Georgia. The reduced squad features two uncapped players, Eunan O’Kane and Alan Judge, while Stephen Quinn (knee) and Harry Arter (groin), along with Clark (quad), are ruled out through injury. Everton’s Seamus Coleman, whose fitness has been the subject of much speculation, is included, though the team’s defensive options could be further limited, as Marc Wilson will remain at Stoke City for treatment on a calf injury, which will be reviewed by the Ireland medical team early in the week. Should Wilson fail to win his fitness race, Richard Keogh, who played in the away qualifier against Scotland, would be the most likely candidate to start alongside John O’Shea at centre-back. The other players omitted who were included in the original 40-man panel are as follows: Adam Rooney, Simon Cox, Anthony Stokes, Anthony Pilkington, Paul Green, Darron Gibson, Greg Cunningham, Shane Duffy, Rob Elliot and Keiren Westwood. Email “A key centre-back is absent from the revised Ireland squad to face Germany and Poland”. Feedback on “A key centre-back is absent from the revised Ireland squad to face Germany and Poland”.